MADE internship with Birmingham City Council. 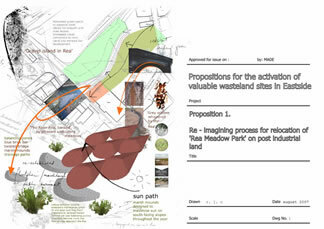 Re – imagining brownfield sites as areas of value in a place poised for re development, led to a proposal to relocate a pocket of greenspace as a more relevant and productive habitat for specific and rare flora and fauna that have colonised the areas of Digbeth and Deritend, due to their previous industrial usage. In addition to this the work sought to change the unsociable activity associated with the site by creating a new transitionary route to the canal towpath and access to the River Rea. The proposal drew on research into biodiversity strategies, historical research and direct experiences to arrive at suggested landforms. Designs were distributed through a publication and event. A great deal of Eastside's treasures are difficult to reach, often restricted through security devices such as railings or razor wire, or just simply hazardous to experience. Bill boards hide the river in certain places, whilst walls restrict the view in others. A new temporary brownfield 'park' would have the benefit of acting as an improved transitionary space towards Curzon Street , the new park development and Millennium point. It would also provide a link to Warwick bar and the Canal network. A current 'desire line' or temporary pathway does exist in the current greenspace. This could be emphasized and explored in the new claimed land, perhaps increasing passive surveillance and provide a much improved and valued link to the canal as both a transitionary and a 'park' space. This could also help accrue evidence of future land usage and human activity. A temporary site such as this could also be an opportunity to tentatively and sympathetically open up physical access to the Rea as a temporary experiential experiment, whilst keeping the culvert's historical value, or even emphasizing its importance. Also, fears that the Rea is 'an open top sewer' are actually unfounded; the river water quality being good enough to sustain many invertebrates and small fish, so, perhaps through experiencing the river, this often heard point of view could change. If the site were to be maintained equally as an artwork and as a site of ecological value, activity from voluntary organisations such as BTCV could combine a kind of 'urban wild gardening' as an experience that in turn develops tactics for improving biodiversity. The work could also provide interest for professional and amateur naturalist groups in the area, encouraging visits by parties interested in this sort of conservation endeavour. The River was and is the constant source for the areas identity. Originally, the river was diverted, drained and harnessed for industry. In the Early 20th century, the floodplain was directed and drained and a culvert made because of industrial activity in the area. As the land does not change because of river erosion we can use the culvert - and in particular forms such as the blue brick simulated gravel bar - as influences for landscape design. Similar to this are the curved features of the viaduct arches which could be mirrored as sculptural industrial forms. The Conjectural Map of 1553 suggests previous 'natural' states such as farmland, heathland and marsh that all can be referenced. Other important influences can come from John Leland, who rode into 'Bremicham' in 1538, noting the 'fulling on side streams', the 'great number of smiths', and the 'gravel islands' in the River Rea. He observed the river dammed for pools and the variety of industries making the most of the lower part of the town that 'standeth very waterish'. He also took great interest the ford through the Rea, adjacent to the bridge, on High Street Digbeth. From this we can ascertain that water and physical interaction with the river feature as important defining elements that need to be reinterpreted. On a pictorial East Prospect Map of 1732 appears the poetic text of 'pleasant undulating meadows' and 'grey willows by the side of the Rea'. This suggests possible landforms and planting. Current Eastside biodiversity strategies suggest that to improve feeding grounds for many species and the ecosystem, landforms should incorporate sparsely vegetated areas with a stony substrate and no topsoil. Shrubs should be winter – fruiting, adding to other seed sources and cover such as tall, rough grassland and scrub. In particular butterflies and moths should be particularly encouraged. Planting would reflect an informed array of native and introduced species which speak of the changing nature and valuable identity of the land. Creating landforms that mimic marshland mounds can also see the area be used for surface water filtration in the form of balancing ponds. This builds upon or re -interprets the historical nature of the site as well as being demonstrative of SMURF (Sustainable Management of Urban Rivers and Floodplains) and the importance of water conservation (SUDS). Perhaps this would also emulate the industrial and functional nature of this landscape that has governed its ecology. The work would use locally sourced and recycled by-products of the redevelopment process. Rubble sourced form other areas of Eastside could be recycled as a 'stony substrate', having parity with, or precedence over indigenous rock and naturally occurring surface deposits. This would also maintain the material and colour palette vital to keep the particular sense of place.